Browsing around Pinterest is a favorite activity of mine. I just never know what I’ll find. On one such occasion I was looking at a pin for a Charlotte Mason memory verse box. We haven’t introduced that habit yet but I loved the idea of using that same concept for our school planning. 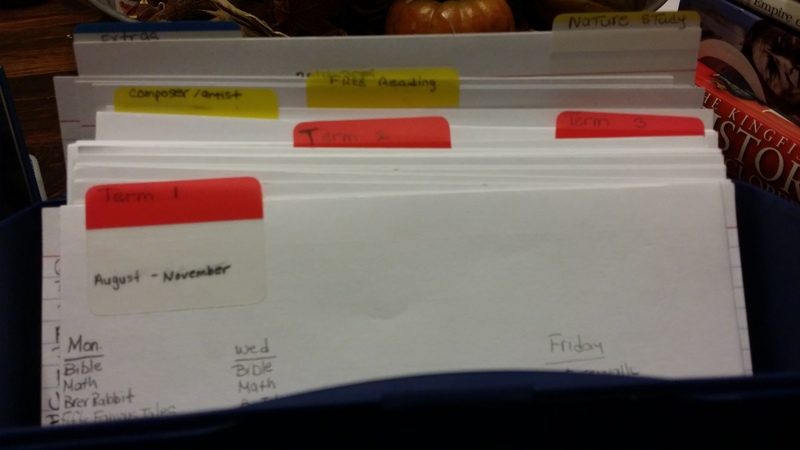 In a previous post I wrote about the progression of my planning methods from a three ring binder to three prong folders then incorporating my phone’s calendar. Now I’ve added a new system in conjuction with my calendar and overall planning pages. This is what the inside looks like. I bought a large note card file box from the Office Max for about $5. Next I bought a set of large white ruled cards, a set of medium colored ruled cards, and a set of small colored ruled cards. 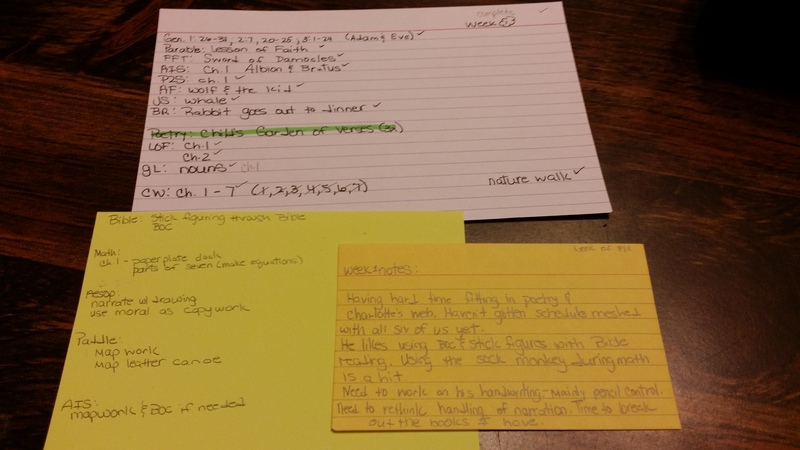 I used some Post-it file labels to seperate out sections into term 1, term 2, term 3, composer/artist, nature study, free reading, and extras. My picture is a bit fuzzy but hopefully you can see it enough to get some details. This is the divider for term 1. It is the same for term 2 and 3 except I do not have a suggested schedule written on it. On the label I wrote term 1 and the months I expect to be in it. Since we school year round, I placed it as August through November. On the card itself I wrote out a suggested schedule. My kids may be loosey goosey, I am not and like to at least attempt to schedule. Mondays are Bible, math, Adventures of Brer Rabbit (because it is a local thing), and Fifty Famous Stories. Tuesday is Bible, math, Aesop’so Fables, Grammarland, Geography (H.C. Holling books), and American History biography. Wednesday is Bible, math, Our Island Story, and poetry. Thursday is Parables of Nature, Trial and Triumph, Just So Stories, Burgess Bird Book, and Shakespeare. Friday is nature study, artist study, and make up work. We do free reading everyday as well as listen to our composer. That looks like a lot but remember, not each book is read every week. For example, Parables of Nature and Trial and Triumph are alternately scheduled on different Thursdays. Each term is a different color card. Term 1 is yellow. 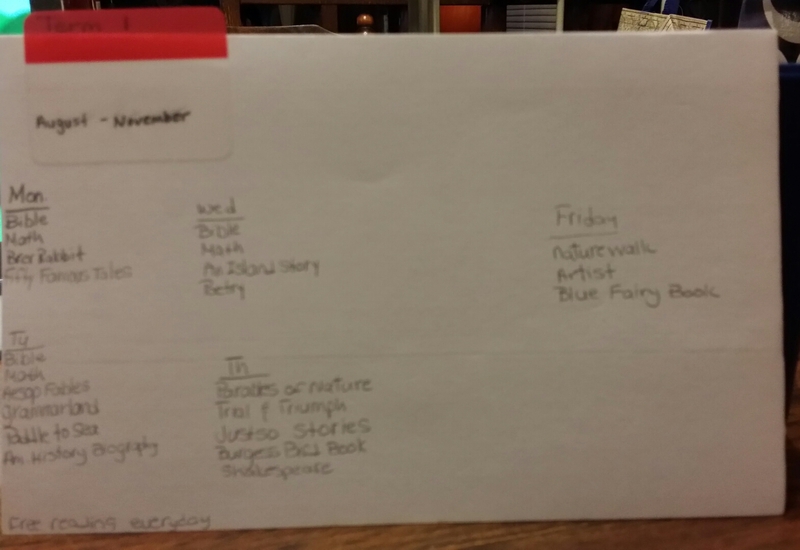 I placed a large notecard for each week then list what is assigned that week. In pencil I write the suggested day. Next is the medium sized notecard. To it I add any additional things I need to know such as mapwork, timeline or extra activity. The small notecard is next. I use it to write out any thoughts or things I want to remember such as something D has said or maybe a change I need to make. This is carried over to each term with term 2 being green and term 3 being orange. the next section is for artist and composers. On the large notecard is the artists and composers for the year. 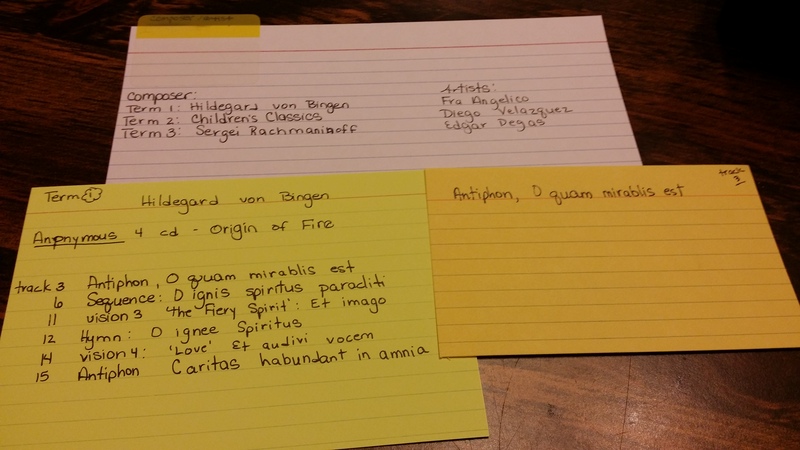 I then place all of term 1 artist and composers on two seperate medium yellow note cards. The same is done for the other terms using their colors. 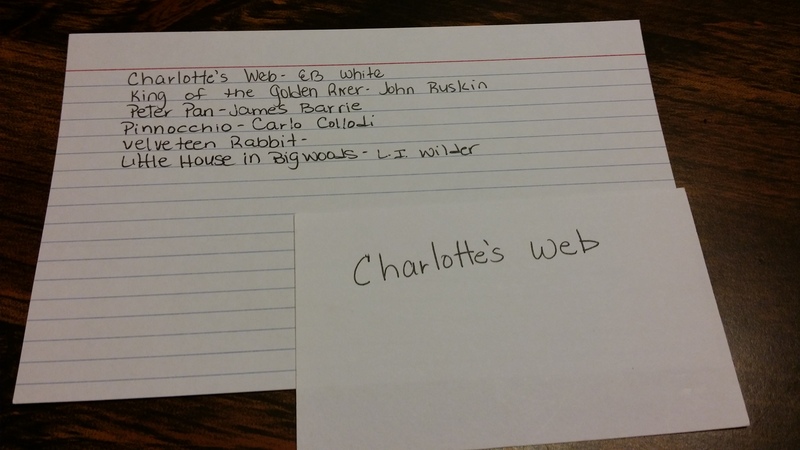 I then placed the individual titles onto small notecards for my notes. the next section is for free readins. The names of the books are written on the large card. Each individual book is written on it’s own card for note purposes. The same pattern is followed for the nature study section. The focus for each term is written on a large card. 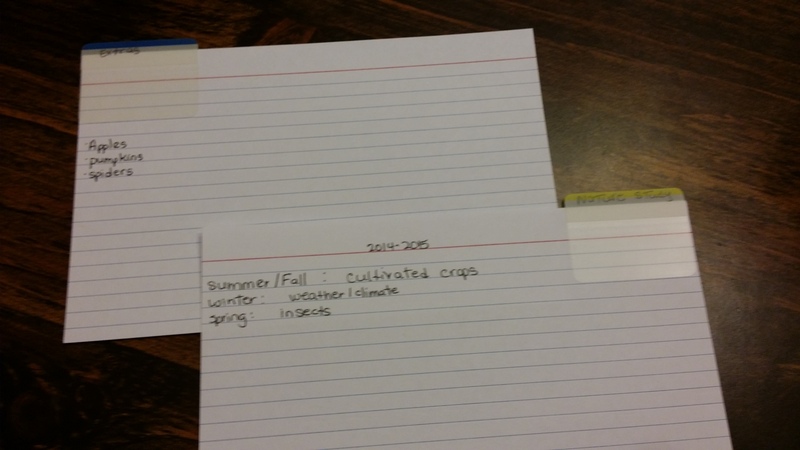 On a smaller white card I list the topic such as cultivated crops. On the back of the card I write what I want to study. I know it suggest cultivated crops in fall, weather and climate in winter, and insects in spring but that is a guide for me. I will tackle what is appropiate for the time. Cultivated crops for fall are apples and pumpkins. Insects for fall are spiders so far. Weather and climate as it happens. The extras section which I do not have a picture of is done the same way. I list topics on the large card and notes on the back. These are for things that come up but don’t necessarily fit into the AO plans or may be of more unit study type thing. I may even decide to use it for handicrafts or music lessons. I haven’t really decided that yet. You may feel this is over kill but so far it is working. Next year I will do the overall year planning in the summer as I did for this year using my notebook and planning pages. I will also start the note box as I plan. Right now the note box is only planned out to one term at a time to allow for changes or getting ahead or behind. It seems to work. The calendar I will continue. I use it more month to month or two weeks at a time. This set up works for me. I can do the advanced planning to know what books to get and get a nice sense of the overall year. The notecards are portable and anyone can take a card out and see what needs done. You just pick it up and go. I am really liking journaling on the smaller cards. I may end up having two cards. One card for my notes and one for D. Makes for nice memories to go back and read them plus easy to grab to blog with or put in school scrapbook. The calendar works to let me check off without a lot of scratch outs or rewritting. I can easily move something to a new date without messing up a bunch of plans. Plus the calendar syncs to both my phone and my tablet. This is important since I keep up with six different schedules.